DO NOT JUST SCROLL PAST THIS PICTURE WITHOUT READING THIS POST FIRST. THANK YOU. One speaker also said that we needed to get rid of 911 calls and we all need to handle our problems ourselves. Well…that’s highly unlikely. I can’t imagine that people will start forgoing 911 calls when their house in burning down in order to try and extinguish the fire themselves. But, ya know, it’s a nice thought. So those were my laughable moments. Trump was about to come out. 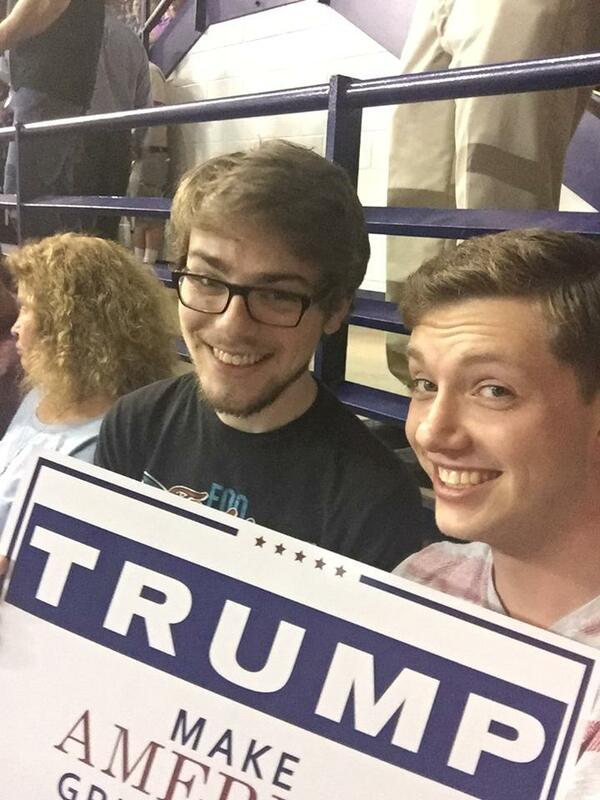 We had our signs ready. We were going to go all out. Yelling and screaming and whatnot. Because, why else were we there if not to join the spectacle? He comes out. People go crazy. For the first twenty to thirty minutes I sat there with high expectations of hilarity. After half an hour, my feelings turned extremely grim. I was scared and upset. Let me explain. Trump basically said the same few things the whole time. He knows exactly what will get a cheer from the crowd and he says it. He mentioned his wall several times. About five or six if I can remember correctly. At one point he said “We’re going to build a wall. And who’s going to pay for it?” And the crowd yelled, “Mexico!” and then they lost their minds. Now, we all know exactly why this is stupid. So I won’t elaborate. It was just very unsettling. He mentioned ISIS several times. About ten. But not exactly how to stop ISIS. Just comments like, “We’re gonna get ISIS,” and “ISIS is going down.” Blanket statements. He did say that for America to win again (any sort of winning, not just against ISIS) we have to go outside of the law and he isn’t afraid to do it. And that’s unsettling for several reasons. But I’m just reporting the facts. And that was all he said on policy. Completely void of content or substance. Just statements that would get the crowd cheering. Now, let’s talk about the protesters. There were many. I think throughout the hour long rally, there were roughly 15-20 groups of protesters. Some of them were individuals and some were in groups. They popped up throughout the rally here and there. And some of them were yelling and causing a raucous but some of them were just standing there with their anti-Trump shirts or their pro-whoever else shirts. They were all removed. Peaceful or violent. One man had a shirt that said “Love is the answer,” and he was thrown out. Trump’s comment on this man was, “And love is very important but I mean, who’s making love to that guy?” And my stomach churned. A few minutes later, a woman stood up not far from where the other man was and starting protesting. She was removed. Trump’s comment was, “She was with the other guy. They’re actually a couple. A clears throat beautiful gagging noises couple.” And the crowd laughed and cheered. It was horrifying. But out of everything I saw, the crowd was the worst part. I have never seen more hateful people in my life. Everyone was just filled with so much hatred. If a protester had a sign, even the peaceful ones, they would take the sign from them, rip it up, and throw it back at the protesters. Whenever a protester would get removed, the crowd would yell horrible things. Once, after a protester was removed, Trump said, “Where are these people coming from? Who are they?” A lady, sitting not 5 feet from me, said, “Well hopefully when you’re president, you’ll get rid of em all!” Get rid of them? Get rid of anyone who opposes Trump? It was sickening. I felt truly nauseous. And these people loved the protesters. They loved the drama and the chaos. And Trump fed upon it. It was easily one of the strangest and uncomfortable things I’ve ever witnessed. I could just hear the horrible things being spoken around me and it made my skin crawl. Needless to say, there was very little laughter on my part. I thought this was going to be joke…and it was, but for a very different reason. I implore you, if you’re thinking about voting for Trump, reconsider. You are only promoting chaos and hatred. I witnessed it firsthand. And trust me, this is not something you want to see in person. This is not what you want to happen to our country. But I’ll leave you with this picture we took with our souvenir. This was taken just before I lost all innocence and faith in humanity.